Getting older doesn’t have to mean losing teeth or developing dental disease. 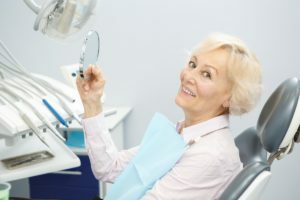 At Cobblestone Park Family Dental, we are devoted to helping our patients enjoy great oral health at any age, including well into their retirement. However, the effects of the aging process do present a few unique oral health challenges. Read on as Drs. Cory and Jennifer Chambers explain how aging can affect oral health. Saliva plays a key part in preventing tooth decay because it washes away food particles and bacteria and neutralizes potentially harmful acids in the mouth. But many of our older patients take prescription and/or over-the-counter medications that make them more susceptible to dry mouth, in turn raising the risk of tooth decay. Our dentists can suggest ways to prevent dry mouth and its side effects. Arthritis can make it painful or uncomfortable to brush and floss the teeth, but these oral hygiene practices are essential to maintaining healthy, strong teeth and gums. Certain dental products, like electric toothbrushes or floss picks can aid in oral hygiene, making it easier to keep the teeth and gums clean. Our dentists can also recommend alternative instruments or techniques to brush and floss without experiencing pain or discomfort. Age is an unavoidable risk factor for oral cancer. We encourage patients of all ages, particularly those over 40, to be aware of any red or white patches or lesions that develop on the tongue, gums or other soft tissues in the mouth. Should these patches appear, they should be checked out as soon as possible by our dentists. We also perform a head and neck exam at every routine check-up to look for other signs of oral cancer. When oral cancer is caught early, it can be successfully treated. Therefore, it’s crucial for patients (of all ages) to schedule and undergo dental exams every six months to a year. Tooth loss is a reality for some of our patients of advancing age. Our dentists emphasize the importance of replacing teeth when they fall out or are extracted. If teeth are not replaced, the surrounding teeth can drift or tilt in the mouth, creating areas where food particles and bacteria can accumulate and lead to gum disease. The underlying jawbone can gradually deteriorate, causing what appears to be the “collapse” of the lower face. We have a variety of tooth replacement options and we are happy to talk through the pros and cons of each with our patients. If you would like to discuss your dental treatment needs and goals with our dentists, please call or email Cobblestone Park Family Dental today.